George Dent has written many articles in Model Rail showing his upgrading various locomotives and has inspired many of us to have a bash at modifying our models. 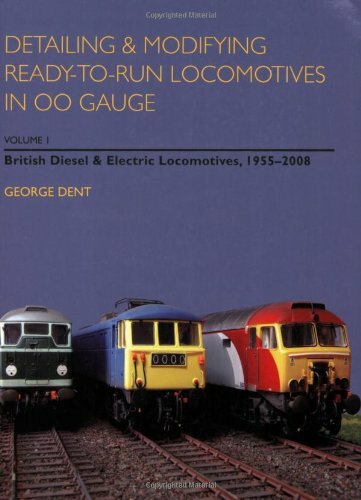 Detailing and Modifying Ready to Run Locomotives in 00 Gauge: British Diesel and Electric Locomotives, 1955-2008 doesn’t disappoint as George brings his skills together in a single volume. There are a number of books that deal with adding added detail and tweaking 00 gauge model diesel locomotives and this is probably the best of them all. George Dent keeps his explanations simple and clear and backs up each with clear easy to see photographs. The book deals with virtually all facets of adding detail to your models and how to get the best from them. The book covers a range of upgrades ranging from adding extra pick ups for improved running, through adding extra detail, to the process of creating different variants within the same class. Detailing and Modifying Ready to Run Locomotives in 00 Gauge is categorised by detailing areas eg buffer beam, fan / grilles, couplings etc. It focusses on specific models eg Class 37, 58 and 67 with exact information on the detailing packs used. It also provides useful notes on ‘free-parts’ sourcing ie how to use detailing parts supplied with other locos and adapt them for use on some of the older models. Detailing and Modifying Ready to Run Locomotives in 00 Gauge is, to diesel and electric modellers in 00 gauge, a highly recommended and must have book.